Niche line Bond no. 9 will launch Shelter Island, a new unisex fragrance, at the end of this month. 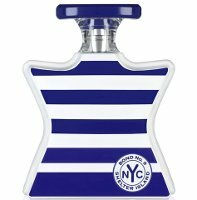 The last scent from the brand was Hudson Yards, which launched earlier this year. First the Hamptons. Then Montauk and Sag Harbor. And at last comes Shelter Island, Bond No. 9’s Summer ’14 beach scent (an astonishing marine oud). The East End is now fully perfumed. The notes include citrus zest, black pepper, white lilies, algae extract, sandalwood, amber, myrrh, musk and oud. Bond no. 9 Shelter Island will be available in 50 ($195) or 100 ($260) ml Eau de Parfum. And with that, Dante’s Inferno adds another circle of Hell. I’m waiting for the Bond No. 9 ‘Gentrification’ — will have exotic notes such as hipsters’ beard and PBR accord. But they already did Brooklyn! A marine oud? I am astonished. I did not know that marine waters were forested with oud infected trees. Maybe I’m showing my naivete, but algae extract? Not an uncommon note these days…they just mean smells sort of like algae, that’s all.